When we think of Henry VIII as a man the image that generally comes to mind is the overweight and smelly man who was filled with rage. Well, at least in his later years. In this article we will be looking back at the younger version of that man who was actually considered attractive. Back then, Henry was a romantic – if we look at Anne Boleyn, who was technically his mistress because he was still married to Katherine of Aragon while he was pursuing Anne and trying to get her to sleep with him…we can use his love letters as an example of how passionate he was when he found a woman he wished to possess. Henry wanted what he wanted and most of the time women did not say “no” to their king. Anne’s own sister did not say no. I’m certain she wasn’t aware that she could or maybe she was not as cunning as her smart sister. In 1509, not long after becoming king, Henry is said to have had an affair with a noble lady who was married – her name was Anne Hastings. Hastings was a Stafford by birth and her brother was Edward Stafford, Duke of Buckingham. Here is a little insight on Edward Stafford, 3rd Duke of Buckingham and the scandal of his sister which caused havoc with the relationship of Edward Stafford and King Henry VIII. A letter was exchanged between two subjects of King Ferdinand II of Aragon that explained what was happening at Tudor court – as you probably recall, this story would be important since Henry’s wife, Katherine was the daughter of King Ferdinand. What lately has happened is that two sisters of the Duke of Buckingham, both married, lived in the palace. The one of them is the favourite of the Queen, and the other, it is said, is much liked by the King, who went after her. Another version is that the love intrigues were not of the King, but of a young man, his favourite, of the name of Compton, who had been the late King’s butler. This Compton carried on the love intrigue, as it is said, for the King, and that is the more credible version, as the King has shown great displeasure at what I am going to tell. The favourite of the Queen (Elizabeth Stafford) has been very anxious in this matter of her sister, and has joined herself with the Duke, her brother, with her husband and her sister’s husband, in order to consult on what should be done in this case. The consequence of the counsel of all the four of them was that, whilst the Duke was in the private apartment of his sister, who was suspected [of intriguing] with the King, Compton came there to talk with her, saw the Duke, who intercepted him, quarrelled with him, and the end of it was that he was severely reproached in many and very hard words. The King was so offended at this that he reprimanded the Duke angrily. The same night the Duke left the palace, and did not enter or return there for some days. At the same time the husband of that lady went away, carried her off, and placed her in a convent sixty miles from here, that no one may see her. The King having understood that all this proceeded from the sister, who is the favourite of the Queen, the day after the one was gone, turned the other out of the palace, and her husband with her. Afterwards, almost all the court knew that the Queen had been vexed with the King, and the King with her, and thus this storm went on between them. I spoke to the friar about it, and complained that he had not told me this, regretting that the Queen had been annoyed, and saying to him how I thought that the Queen should have acted in this case, and how he, in my opinion, ought to have behaved himself. For in this I think I understand my part, being a married man, and having often treated with married people in similar matters. He contradicted vehemently, which was the same thing as denying what had been officially proclaimed. He told me that those ladies have not gone for anything of the kind, and talked nonsense, and evidently did not believe what he told me. I did not speak more on that subject. So, the whole matter with Anne Hastings was to be kept quiet it appears – but obviously many new what had happened between the king and Lady Hastings. The next time we hear anything about a mistress is after Henry’s war with France in 1513. When Henry left for France he made Katherine of Aragon regent in his place – she in turn went on to defeat the Scots, who believed England to be undefended with the king in France and in turn their king, James IV was killed in battle. Katherine was victorious and Henry had also won his battles in France but was most likely out shined by his queen which would have bruised his ego. There was great celebrations after winning his battles in France that Henry VIII went to the court of Margaret of Austria (daughter of the Emperor) to celebrate their joined victory – it was there that his apparent love affair with Étiennette de la Baume happened. Étiennette de la Baume was a Flemish woman who was a maid of honor at the court of Margaret of Austria, Archduchess of Savoy and Regent of the Netherlands, she enjoyed the attentions of King Henry VIII during his visit to Lille in 1513. The reason it is believed that Étiennette was mistress to the king is because in August 1514, when she was about to marry, she wrote to the Henry VIII, sending him “a bird and some roots of great value” and reminding him that he had promised to give her ten thousand crowns as a wedding present. It is unclear whether or not Henry sent her the gift or whether is confirmed as his former mistress – some believe her letter is a sign that she was indeed a lover of the king. Also in 1514 is when it appears that the marriage between the king and queen was weakening due to Katherine’s lack of a living child. In this year it is believed that Henry may have begun his affair with Bessie Blount, according to authors Kelly Hart and Philippa Jones. Bessie gave birth to a son on the 15th of June 1519, the king was ecstatic and acknowledged the boy, who would be called Henry Fitzroy. The son of a king. He would leave Fitzroy on the back-burner, but well raised, in case his wife would not give him a son. The earliest reference of Jane Popincourt shows up in the Privy Purse expenses of Elizabeth of York in 1498.² Kathy Lynn Emerson, creator of “Who’s Who of Tudor Women” states that Jane was a French-speaking lady assigned to teach the language to Henry VII’s daughters, Margaret and Mary, through “daily conversation.” Nothing is known of her background. Some records identify her as French, others as Flemish.¹ Author Philppa Jones of “The Other Tudors” says that Jane was attached to the household of Princess Mary from nearly the time of her birth and her job was to teach Mary, and there is no mention of Margaret. In 1512 was a member of Katherine of Aragon’s household. She became notorious during the stay of Louis d’Orléans, 2nd duc de Longueville at the English court as a prisoner of war. Longueville was captured at the Battle of the Spurs and sent to England as a prisoner of war to wait for his ransom (100,000 crowns) to be paid. While in England he took Jane as a mistress. When Queen Anne of France died, Longueville took an active role in negotiating the marriage of Louis XII of France and Henry VIII’s sister, Mary, and served as proxy bridegroom at the wedding at Greenwich Palace. The following day, his ransom having been paid, he left for France. Jane had expected to journey to France as an attendant to Princess Mary. It is believed that she hoped to be reunited with her lover there, but her name was struck off the list at the last moment by King Louis XII – he had supposedly discovered that Jane had been the mistress of Longueville, whose wife was at the French court. Jane stayed in England for a time after and is said to have had a brief affair with Henry VIII until King Louis XII died in January 1515. When the French king died Henry gave her a gift of £100 and Jane returned to France to be with Longueville who then unfortunately died in 1516. It is believed that before Henry found Mary Boleyn that there was a lady by the name of Mistress Parker who had a short tryst with the king. It is unknown exactly who this woman was but there are some thoughts on the matter: Author Kelly Hart writes, “it has been suggested that this was Arabella Parker, a merchant’s wife, or Margery Parker, a member of Princess Mary’s household.” “It could also refer to Jane Parker” who later married George Boleyn. Author Philippa Jones also makes the same suggestions but seems to lean a little more toward Margery Parker since she was in his daughter’s household and this would have given him easy access to her. However, since Jane Parker was also the same masque as Anne Boleyn in 1522, it is possible that he noticed her there as well. “While we don’t know the exact date of the commencement of King Henry’s affair with Mary, it is likely to have begun about 1522. 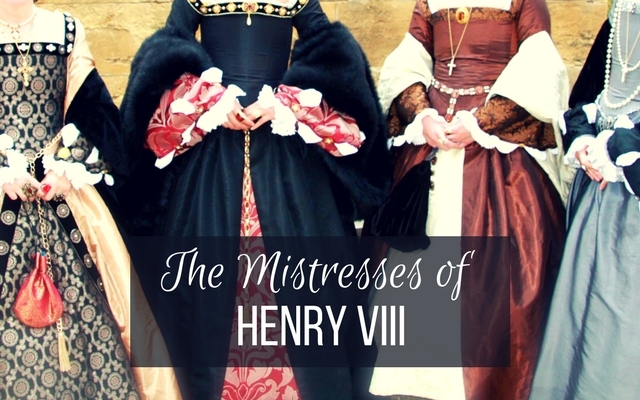 Mary participated in a pageant during a celebration for the Spanish ambassador in March of that year and may have caught the eye of King Henry with her dancing. It is possible that Mary did not go the King’s bed willingly, wanting to honor her marriage vows. Whatever happened, Mary and Henry began an affair which may have lasted until 1525. “Renewed and increased the love he formerly bore to another very handsome young lady of the court; and whereas the royal mistress (Anne Boleyn) hearing of it, attempted to dismiss the damsel from her service, the king has been very sad and sent her a message to this effect: that she ought to be satisfied with what he had done for her, for, were he to commence again, he would certainly not do as much; she ought to consider where she from and many other things of the same kind. Yet no great stress is to be laid on such words….Anne knows perfectly well how to deal with him. Kathy Lynn Emerson of “Who’s Who of Tudor Women” believes this lady may have been Elizabeth Hervey/Harvey who was referred to as Bess. Henry would have turned to Bess during Anne’s pregnancy in 1534. It is known that the lady was a friend of Lady Mary (Henry’s daughter). Queen Anne attempted to remove her competition with the help of her sister-in-law, Lady Rochford but their mission failed and Rochford was instead dismissed from court for a time. David Starkey’s Six Wives recounts that Bess Hervey/Harvey was in service to Anne Boleyn and on “friendly terms” with Sir Francis Bryan. She was sent away from court in 1536, although she claimed she did not know why. If she was the “handsome young lady,” she had lost the king’s interest by then. She was not appointed to Catherine Howard’s household, but during Catherine’s tenure as queen, Catherine gave Bess the gift of a gown. Starkey also suggests Bess was Thomas Culpepper’s paramour. Some have believed that Anne Boleyn herself had convinced her cousin, Mary Shelton to become a mistress of the king. If his mistress was a family member then Anne would certainly remain secure on her throne. The love affair merely lasted six months and then it was over – Anne Boleyn’s plot had been foiled. After Mary Shelton and before the execution of Anne Boleyn, Henry was courting Jane Seymour. There were other ladies who were rumored to be the king’s mistresses: Mary Berkeley, Jane Pollard, Joanna Dingley, Anne Bassett and Elizabeth Cobham – but we’ll leave those ladies’ stories for another day. Becoming a mistress to the king meant that favor was brought to you and usually your family. To be chosen may have been flattering to some and a curse to others. For Anne Boleyn it made her a queen, for her sister, well, she did not have the fantastic life her sister had but she did find true love and she did outlive all of her siblings. That’s has to account for something, right? WANT TO LISTEN TO THIS EPISODE OF MY PODCAST?